After the success of our death certificates purchasing app, we decided to flip the switch and tackle a much happier topic — birth. 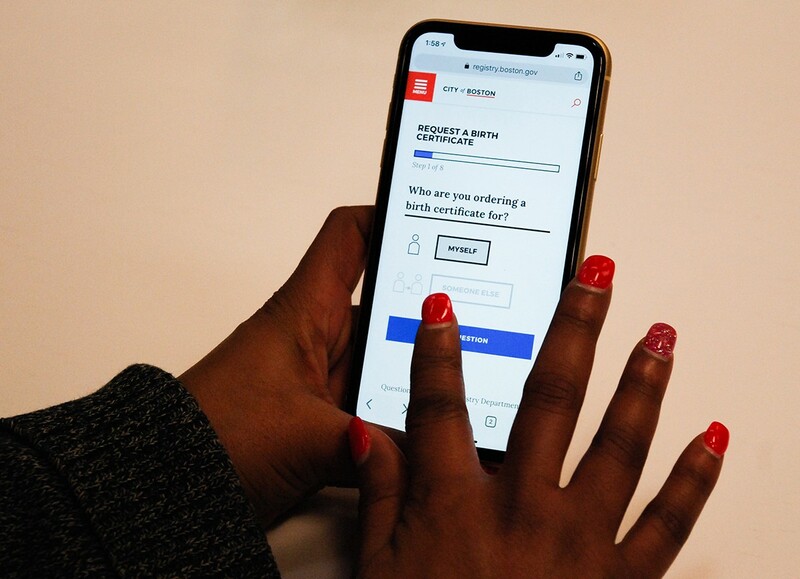 When we launched our death certificates app in March 2018, that was just the beginning of our work with the Registry Department. By using death certificates as a jumping off point, we were able to tackle another urgent need: people ordering Boston birth certificates through the City. A look at our new birth certificates application. At the beginning of this project, we invested time researching the reasons why people get birth certificates. The goal was to understand who the audience for the application was, and to ensure our design met their needs. We soon found that the reasons for why people look for this information are too numerous to count. Whether you’re registering a child for school, voting, or getting a driver’s license, you need a birth certificate. It didn’t take long to figure out that our audience was basically everyone. Birth certificates are very important for children under 18. But, they serve as vital documents throughout a person’s life. Our application had to address the many reasons why someone might be requesting a birth certificate. We also couldn’t assume that the person making the request was actually the person on the record. Parents often submit requests for their children. One big reason we felt the need to move online was the increased demand for birth certificates. This is thanks in large part to the REAL ID Act, a piece of legislation passed in 2005 by the federal government. The act mandated an “enhanced driver’s license” be issued separate from standard licenses to citizens. Soon U.S. Citizens will need either this enhanced driver’s license or a passport to enter certain federal buildings and to fly in the United States. The act included more stringent requirements for verifying a person’s identity to receive a license. In Massachusetts, you need your birth certificate just to get a license. For this reason, the Registry Department has seen a huge uptick in requests as we near the federal deadline for compliance with the law. The law will go into full effect on October 1, 2020, so birth certificate requests will only continue to grow. Creating an online option for this process will make things easier and more efficient for both residents and City staff. And let’s face it, for a lot of folks, it’s just not easy to get into City Hall. Whether you need to find a babysitter or take time off of work, the trip can be a real hassle. If you live out-of-state, it’s even more of a pain. While it’s true that there was always a mail-in option with the Registry Department, the process of printing out the form, mailing it, and waiting for the order to be processed and mailed takes a few weeks. People on a tight timeline were left with few options. Moving these types of City services online for residents and those born in the City just makes sense. It’s worth noting that, before we started this project, the process of ordering birth certificates was not entirely offline. People still have the option to go through VitalChek, a third-party service contracted by the state, to find their vital records. But, requests often cost more than $40, not including shipping and processing fees. Orders can also take more than a few weeks to process. As the main source of truth for birth certificates in Boston, we felt that we were well-positioned to offer a quicker, cheaper, and more streamlined option. While it might seem easy to just tweak something on our backend to change from “death” to “birth”, it’s not quite that simple. There are actually some distinct considerations for birth certificates. Most states have strict regulations on vital records, and that includes Massachusetts. In some cases, only certain authorized people can access a record or certificate. For example, if the parents were married at the time of a child’s birth, that generally makes the child’s birth certificate unrestricted. Anyone can look up the certificate and order a copy. For children whose parents weren’t married at the time of their birth, their record is restricted. Only those people listed on the birth certificate can order a copy. We had to keep this type of tricky situation in mind when building our app, and we’ll need to continue to keep our eye on state policy should it ever change. For our first prototype, we mirrored what we set up with our death certificates application. There was a basic search function that would allow users to select and buy a birth certificate. We quickly realized, though, that this wouldn’t work. Testing it with constituents who came into City Hall, we found that most people wanted to treat it like a search engine. This type of search works for death certificates because they’re all public records. But, because of the restrictions around birth certificates, we couldn’t do that with this new application. Some of the best feedback we received was in our second round of testing with staff from the Registry Department. They helped us see an opportunity to create a more personal experience. Registry staff are always looking for a few key details when trying to find someone’s information. We realized that we could set up an experience that guides each person along a journey, gathering answers that the Registry Department needs to complete the request. Instead of using basic search, we used progressive disclosure to simplify the complexity of the request. 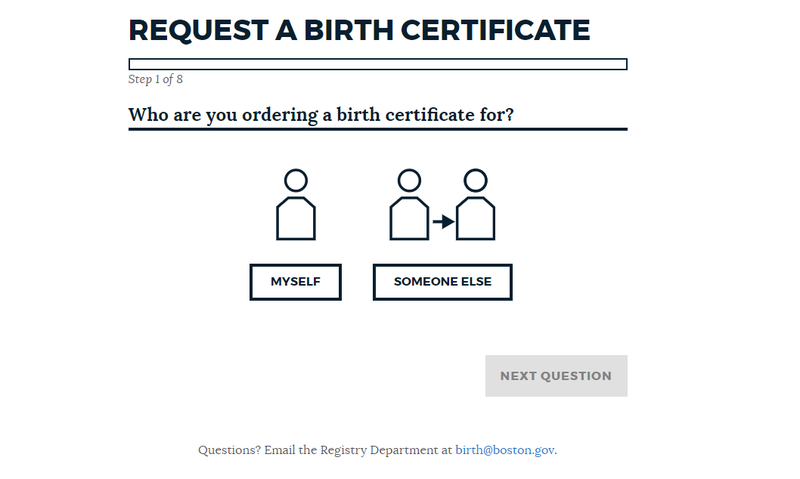 This interaction design technique helps both customers looking for their birth certificate and City staff looking for their record. We drew inspiration from online tax systems created by H&R Block and TurboTax. From the start, we ask our users specific details about their situation, and then craft prompts and responses based off those answers. Whether you’re getting a birth certificate for yourself or someone else, our application guides you through the process in a step-by-step manner. We created a step-by-step process for folks ordering birth certificates online. Just as with death certificates, we’re using Stripe for payment processing. Birth certificates cost $14 per copy, and that price includes shipping. Users will also be charged an extra service fee of not more than $0.25, plus 2.15%. That fee goes directly to Stripe to pay for the cost of card processing. When you consider that the only other online alternative was more than $40 per request, this is a significant savings for our users. Much like death certificates, our new application is built using React and Next.js. We won’t get into the weeds around all of our technical considerations. The approach we took very closely mirrored our work on death certificates. This medium post from March about death certificates dives into those type of backend details. What’s next up for the Registry Department? Marriage Certificates! We plan to create another online tool that will complete the full Registry suite — birth, death, and marriage. The work we’ve already done will make building this tool much easier. We’re hoping to have something for you soon. As always, the Digital Team will continue to work with departments across Boston to create intuitive online tools for its residents. We want to find more ways to give you an enjoyable — maybe even delightful — experience when you interact with the City of Boston. For non-emergency City services, dial 311, tweet @BOS311, or visit boston.gov/311. The City of Boston’s Innovation and Technology Department engages, empowers, and improves life for residents in the City through technology.